This is the first time in years that I’ve started track workouts, or speedwork. I currently use two facilities. I use a high school track that is close to work. Closer to my house, I use a park with a half mile track around ball fields. I love using both, but the high school track definitely has more people using it, and it has the best surface for intense speedwork. Before going to a public track facility, there are a few rules of etiquette to keep in mind. In many places with indoor walking tracks or measured walking loops, there are designated days and directions posted. This does not apply in outdoor track and field. All runners/walkers must move in the same direction which is counterclockwise. Especially if you’re visiting during an organized practice, use the outer lanes. Reserve the inner 3 lanes for faster people or those who are associated with the field’s ownership. If you go to the field during the home team practice, be prepared to wait it out. One loop is 400m. Four loops is a mile or 1600m. For intervals of 100m, use 1 straightaway. For 200m, use half a curve, a straightaway, and half the next curve. 200m is exactly half a loop. If another runner is needing to go around you, on a track, they will yell “track” or “coming left” or something similar. If you hear anything like that, move to the right to the slower lanes (which are the outer lanes). Faster runners keep to the left. 5. Leave the music at home. This is a hard one for me. If the track has a lot of people, I will not use music. This is a safety issue so I can hear other runners. However, if I’m one of the few people using the track by my house, music is a must! 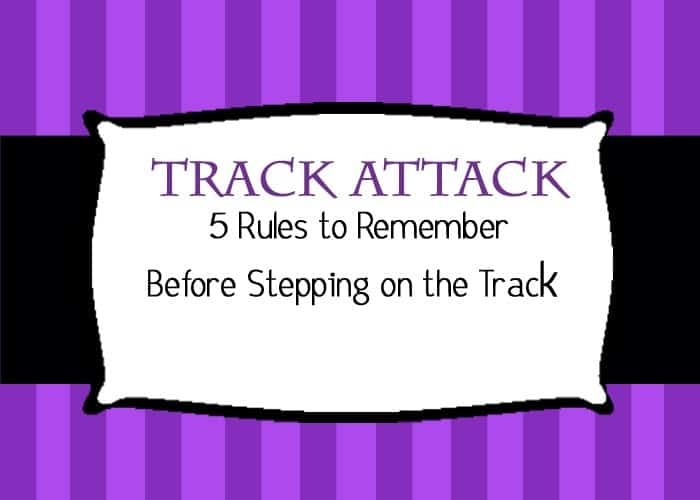 With these few rules in mind, a track workout is an excellent way to work on speed and really get in a tough workout. There are days for easy running in a therapeutic way. And there are days to leave it all out there and drag my behind home with nothing left in the tank.